A flock of galahs are the feature of my journal page for Janie's beautiful book of Simply Whimsical. Janie loves animals as much as I do, so I know she'll like these guys :) This journal is visiting from Cairns, Queensland as part of a swap with the Australian Art Swap Group. A fantastic group of artists, all with one thing in common... an enthusiastic passion for all things colourful, creative, arty and fun! Its awesome - click here to visit the Facebook group. I used Dyan Reaveley's Dylusions acrylic paints in Mushy Peas (green), Vanilla Custard (yellow), Slate Grey and White Linen along with stencils by Tim Holtz and Dina Wakley, Tim's stamps, Sizzix die templates (using the Sidekick), Dina Wakley's Art Sticks, Jane Davenport's Mermaid Markers, Tim's Idea-Ology Botanical Layers and We R Memory Keepers' Stitch Happy Silver Thread. 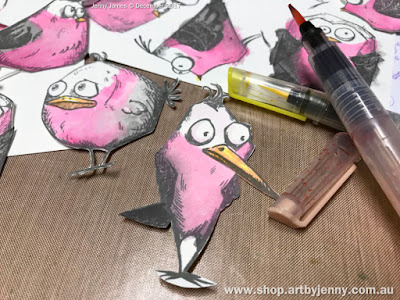 My initial idea was to have a couple of magpies made using the Crazy Birds with a nest featuring a newly hatched nutty adorable bird with paint brushes and pencils (see the scribble in the pic above)... but it soon turned into something completely different! Whimsey is all about being funny, adorable and simple - so I tried to stick to limited colours and design for the background. You can see below that I was on my way to creating that page with the nest. Using an ink blending tool (with the round foams), I stencilled through Dina's Jungle stencil across the top of the page with the Mushy Peas. I then introduced Slate Grey with Tim's Scribbles stencil by along the bottom and top left corner. 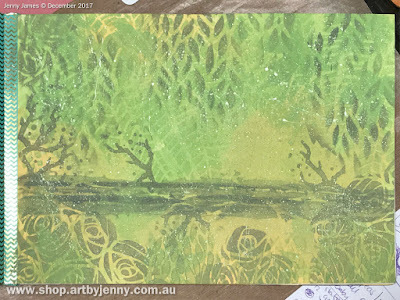 I mixed the grey and green together on my craft mat and stencilled through Dina's Leaves stencil and then Tim's Leafy (which is similar to Dina's but smaller leaf design). 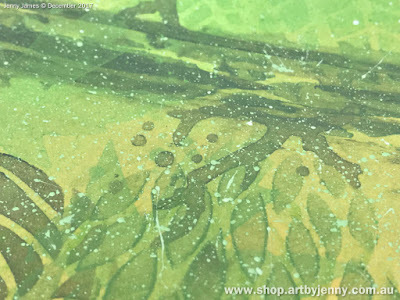 Each time I picked up more paint, I alternated between the green and grey-green mix. Next was the branch created using Tim's Birch stencil, first with the green-grey mix then twice more just the grey. Eventually it started looking like an actual tree branch. The little branches were stencilled with Tim's Autumn stencil, flipped and flopped to get the different branch directions. The same stencil was used with Mushy Peas to add big maple leaves here and there on the page... galahs don't live in maple trees but they don't seem to mind! 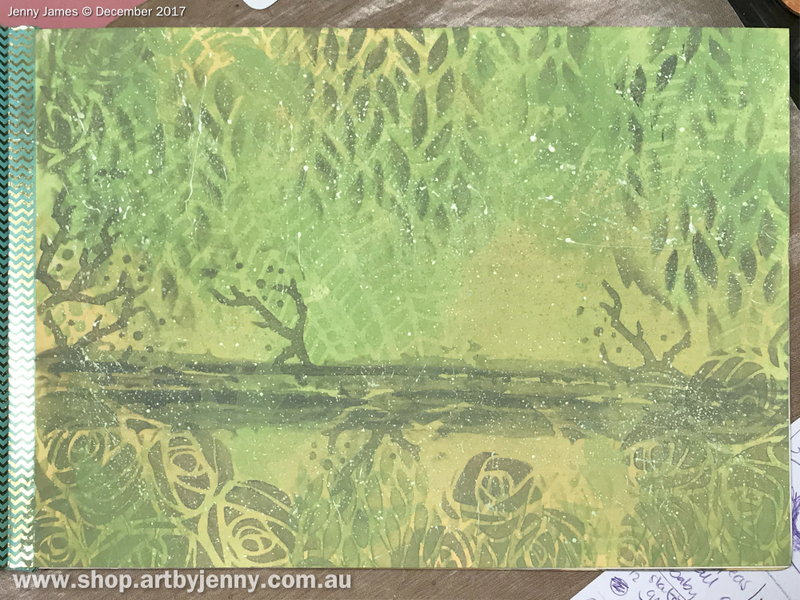 Lastly, I splattered pale green paint (white with a touch of green) and then white paint over the page using a Tim Holtz Splatter Brush. The background dried pretty fast but I put it aside for a while anyway, while I stamped and coloured the birds. 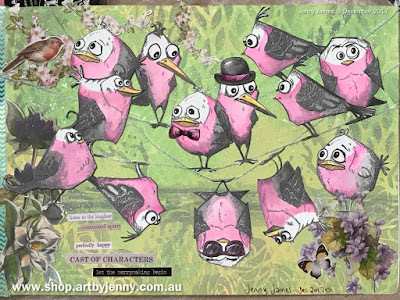 Galahs are grey and pink with hints of white so I've stamped them all using Watering Can (grey) Archival Ink. 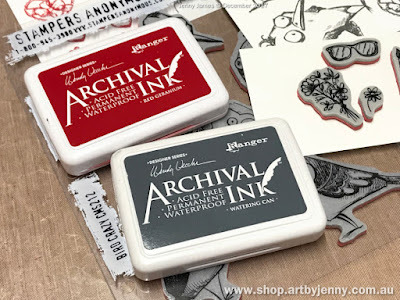 The Red Carnation Archival Ink was used to stamp out sunnies, brushes, hats and ties. Colouring these fun Aussie birds wasn't difficult but it took a couple to get them pink rather than bright pink or rosy red... 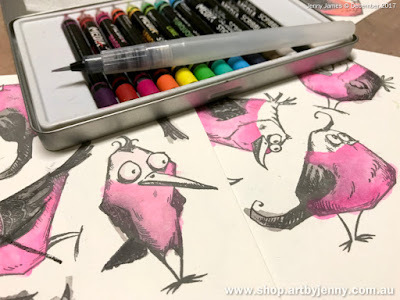 I ended up using Dina's Paint Sticks in Fuchsia, White and Black for the feathers and Jane's Mermaid Markers in Sand Bar and Beach for the beaks. 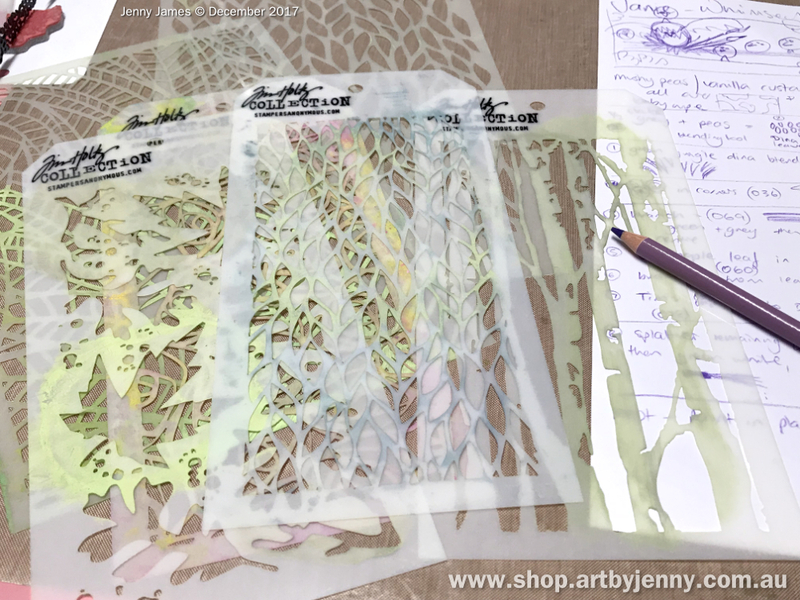 Before I glued everything down, I played around with different Botanical Layer die-cut pieces and placement of the Stitch Happy silver thread. Each wire across the page is a twist of 3 threads, glued down with Glossy Accents. Galahs are such fun Australian birds ... they love to swing, jump and laugh together on electric wires, tree branches and telephone cables. After all the birds were attached, I decided to use the bowler hat, bow tie and sunnies after all. I had put them aside for a while, unsure of where my page was going. All the eyes were redrawn using black Dylusions paint pen with the highlight dotted with white Dylusions paint pen. Tim's salvaged thoughts and sayings are perfect for journal pages. 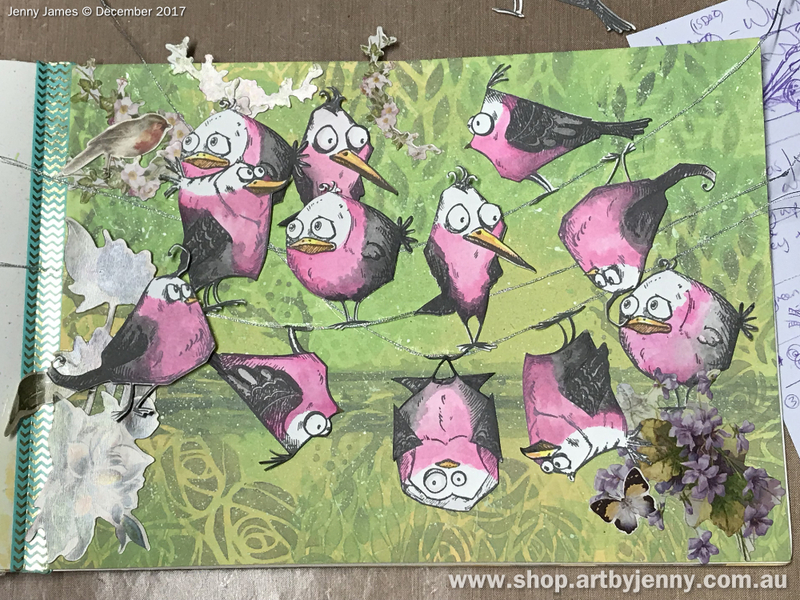 I've used 2 sets - the Clippings Stickers and Metallic Christmas Stickers to say "listen to the laughter, contented spirit, perfectly happy cast of characters, let the merrymaking begin". Thanks so much for visiting my craft blog. Sing out if you have questions or need a hand :) I'm here to help anytime.